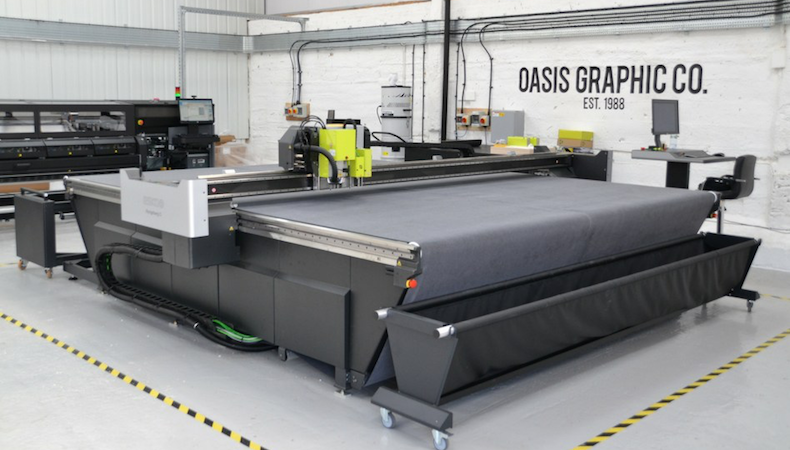 UK-based Oasis Graphic specialises in the production of large format digital printing for use at exhibitions, retail environments and for workplace branding. The company is continuing its growth strategy with a building expansion and investment in an Esko Kongsberg C64, a 3.2m HP L1500 Latex roll-to-roll printer, and a 1.63m HP 560 roll-to-roll Latex machine. Next steps include better resources in the studio and, as part of new business development, a focus on the workplace branding sector. “It is a very exciting time at Oasis - there is a great deal of momentum as we grow and develop,” commented Oasis owner and MD, Simon Osborne. Growth has been a focus for Oasis for some time now, which acquired Mustard Solutions in 2015. Its current production facility has been extended with an additional building of 278m². “The reality is we have a product that is in demand. We must respond to our customers’ needs and investing in the production capabilities of the business is the best way to do it. We can improve efficiency, quality and our service offering this way,” Osborne added. “It has taken a lot of research, both internally (where our bottlenecks are and where the customer demand is) and externally (which machines will improve efficiency, quality and offer a wider range of products), to get to the right resolution for the business,” commented Operations director Andy Delpech about the new kit investment. The purchases of all new equipment have been made through CMYUK. With the two new HPs Oasis now can offer improved textile printing while increasing output. The company pointed out that it had a need for more dedicated roll-to-roll capacity, and the ability to use more eco-friendly materials - now an increasing demand from clients. The focus for the machinery investment is efficiency, and the HP printers will allow for unattended volume print runs, and print-and-cut without lamination or outgassing.